Maybe it was opening day excellence (with the boss breathing down the neck of the staff)? I was unable to find anything wrong with the recipes or preparation. We will see as reality sets in and they discontinue the use of the spit (there were two) like Falafelji further south on Harlem. Even the salad was fresh and crisp. I was the only customer and most items were prepared fresh. Last edited by Panther in the Den on January 11th, 2018, 11:59 am, edited 1 time in total. 129 N. Oak Park Ave.
Their website has the address as 128 N. Oak Park Ave. Even the article showed 2 addresses but the Google Street view showed the ‘Coming Soon!’ Signs. Panther in the Den wrote: Opening in the Harrison Arts District by October 31st? In the same row of store fronts that also houses Happy Apple Pie Shop (226 Harrison St). They better get going to meet that date. Last edited by Panther in the Den on May 16th, 2018, 9:01 pm, edited 3 times in total. Forest Park. Driving by we noticed the mention of restaurant and cafe. I had a friend go a few months back. Pretty sure he has not returned or wanted to return, though in his mind it might have been worth it just to say he'd been. "Opening Soon!" "Now hiring!" Looks ready to go. Maybe we will be surprised! Driving by today I noticed the cases (deli and beverage) were filled. OAK PARK— Taste of Brasil has been closed for more than five months, but ownership is on the comeback trail. Via Facebook, they’ve announced plans to take over the former Live Fresko space at 136 N. Oak Park Avenue. That is great news! I always enjoyed their offerings. That space is not that different (better location). It would be fun if they would team up with the former owners of Aripo's. Avenue Ale House gets new owner. Never terrible, always passable. The rooftop is our favorite outdoor seating. I love the Happy Apple Pie Company (a full bag of key limes in every key lime pie), but I'm avoiding sugar so I'm not patronizing them often. 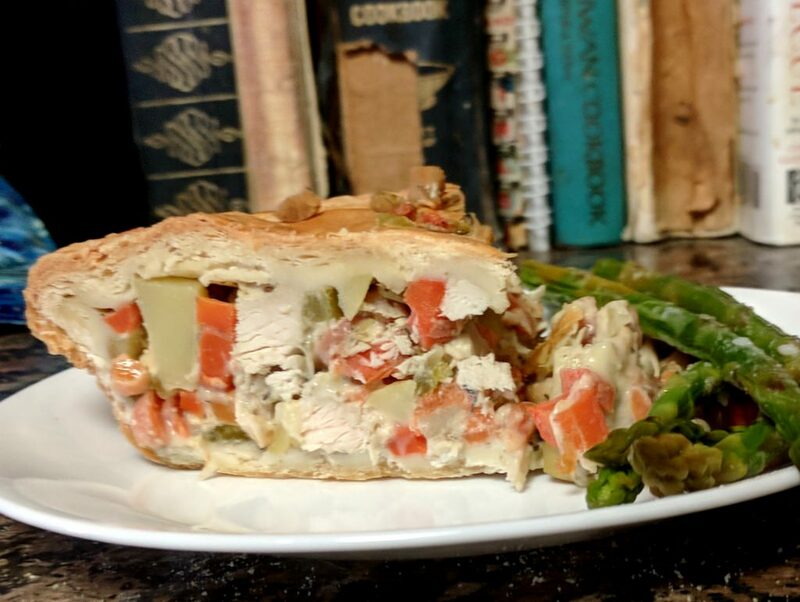 But their Facebook page recently mentioned chicken pot pie and since hope springs eternal despite all the terrible pot pies in this world (I'm talking about you, Walnut Room) I went in and picked one up for dinner. Fantastic. A real pastry crust--top, bottom, sides--that stayed flakey through reheating. Chock full of chicken, potatoes, and carrots in a light broth instead of a gloppy gravy. I heated it in the oven as instructed for the first serving, but since then I've just been doing a slice at a time 3 minutes in the microwave and it's still been good. I also heard a great story. They always have apple pie on the menu, of course, and generate a lot of apple peels. They hated the idea of paying someone to take them away and compost them when one of the employees mentioned that there's a woman in Austin who raises goats. So now the woman in Austin comes up and picks up the apple peels every other day and the pie shop uses her goat cheese in their quiches. Talk about local! They'll have pasties next week. I'll be there to see how they stack up to the Upper Peninsula's best. Stopped by Q-BBQ on Sunday and I hate to say it but the brisket at Pete's Fresh Market only a couple miles away is vastly superior. Between the three of us we sampled a good portion of the menu and nothing is calling me back. Shame as it would have been great to have good BBQ in Oak Park. Saw lights and tv’s on and knocked on the door. The new Taste of Brasil (or whatever they end up calling it): there's no kitchen in that space, and there's only room for a couple of tables, so I'm sort of intrigued about what they have in mind. Less hopeful that many of my old favorites will make it over, though. Cafe Descartes, btw, in addition to weekend Indian popups, seems to be selling Carnivore sandwiches now, which is awesome for both. Panther in the Den wrote: Forest Park. Driving by we noticed the mention of restaurant and cafe. Vitesse98 wrote: The new Taste of Brasil (or whatever they end up calling it): there's no kitchen in that space, and there's only room for a couple of tables, so I'm sort of intrigued about what they have in mind. Less hopeful that many of my old favorites will make it over, though. I’m not sure how much of a kitchen they had at the old location? Not full by no means. They will probably start out like they did before with just the savory pastries and maybe a weekend special. Didn't they have a (small) kitchen in the back? They had to cook those steak sandwiches somewhere. Were the fried coxhina snacks kept in the warmer made off-site? How about the soup? Anyway, I was under the impression the new place would have even more of a sit-down concept. Date night and thought we would give the place a whirl. It was a little late by the time we made it there but they do keep late hours (midnight) Friday and Saturday. Quiet this evening with only one other table occupied. The live music livened up the atmosphere. After a round of before dinner cocktails we decided on the often lauded Empanadas. Cheese/onion and Chicken. They were nicely fresh and flaky. The Chimichurri sauce was perfectly prepared with the requisite hit of garlic. Appeared to be made with parsley. My Bride has always been a fan of a Charcuterie board and it is nice to it finding a home on several area menus. The melted Brie tickled her fancy this evening. My Chicken with Cream Sauce over Rice tasted good but was not very photogenic and could of used a touch more sauce. Along with the entrees we went with some Merlot. To finish up we turned to dessert. Fried Plantains topped with Honey and Whipped Cream filled the bill as something sweet sounded great. It was a great evening and we will be back again. Just a word to the wise... They have a strong disclaimer that they can only run your credit card once (for security) which means you must mention the tip to be added as they take the credit card. Also the did not have much cash on hand to make change. My wife and I have been to Amerikas restaurant several times, including a special valentine's day menu. Everything is amazing. I have sampled pretty much the whole menu and can report each dish is perfectly executed and amazingly conceived. You can't go wrong. Order and enjoy. Though for dessert make sure to get the chocolate dome. The restaurant was busy and the service slow. Food? Pretty good for what it was. I had visited the old restaurant, La Leyenda Taco and thought it was good as well. Same owners but since the old cook went back to Mexico they thought they would switch things up. Wide varieties of meats available but no pastor spit. I am not sure they will be able to replace Ino’s on Roosevelt. Last edited by Panther in the Den on March 3rd, 2018, 4:18 pm, edited 8 times in total. Mora "Asian Fusion" coming to Harrison St., continuing what seems to be a trend of suburban strip mall-friendly franchises coming to Oak Park. At least it's not another mediocre/middle of the road brewpub. Vitesse98 wrote: Mora "Asian Fusion" coming to Harrison St., continuing what seems to be a trend of suburban strip mall-friendly franchises coming to Oak Park. At least it's not another mediocre/middle of the road brewpub. It’s been “Coming Soon” for almost 2 years now. Maybe May? It is a part of a small chain. Very broad question here, but I'd like to pick the brains of the knowledgable food folk here: how do the food and wine/beer landscapes of Oak Park and Evanston compare? I ask because I often hear the two suburbs compared, but I rarely hear comparison of their dining and drinking options. What's best in each town, and what's missing? I'm guessing Evanston has better food and its certainly closer to more options on the north side of the city and suburbs like Skokie, Niles, etc. Oak Park is pretty much on an island. Because I live in Oak Park I never go to Evanston. Sorry, Evanston! rtb178 wrote: how do the food and wine/beer landscapes of Oak Park and Evanston compare? I ask because I often hear the two suburbs compared, but I rarely hear comparison of their dining and drinking options. Evanston is certainly larger (approx. 75,000 not including Northwestern students, vs. approx. 52,000 for Oak Park). There are four (soon to be five) breweries in Evanston ... not sure, maybe two in Oak Park? Probably more restaurants in Evanston, although both seem to have more independent restaurants than most subdivision/strip mall suburbs. Both are referred t as "The People's Republic of ..." Both have a lot going for them. teatpuller wrote: I'm guessing Evanston has better food and its certainly closer to more options on the north side of the city and suburbs like Skokie, Niles, etc. Oak Park is pretty much on an island. I live in Oak Park, but grew up in West Rogers Park across the street from Evanston. Evanston is much bigger than Oak Park, about 8 square miles as opposed to less than 5, based on that alone, there are definitely more options in Evanston. In addition, the University and the fact that there are more hotels in Evanston, there are subsequently more dining choices. That being said, if you want to start including the "north side of the city, Skokie, Niles, etc." as Evanston accessible dining, then I can just as easily include the West Loop and Downtown as a quick 7 mile ride down Lake street (ignoring the trip thru the West side) and the scene starting to emerge around 18th in Pilsen (a quick shot down Roosevelt). Now, when it comes to food, would I rather be nestled between Wilmette, Niles, Skokie and Rogers Park as opposed to Austin, Berwyn, Galewood and Maywood? That would be a resounding yes. Living in Oak Park and singing regularly in Evanston (I spend an inordinate amount of time stuck on Lake Shore Drive), the highlights for me up north are in no particular order: Kuni's for hot towel and chutoro and agedashi tofu, Cross-Rhodes for Greek fries, Union Pizza for mixed drinks and lamb sausage pie, Edzo's for burgers, and now Peppercorn's for bubble tea and cumin lamb. That Dollop / Hoosier Mama locale seems to be going downhill to me (soggy off-flavor sweet pies, though hand pies are still good) though I like the wide hours. I think each example here is slightly better than or missing from comparative Oak Park selections (Sen Sushi, Papaspiros Greek, any thin pizza place in OP proper, Scratch for burgers, current Katy's iteration for Szechuan, Sugar Fixe or Spilt Milk for bakery-coffee combo).